Mr. Glenn McCloskey joined us for our July member’s meeting as our guest speaker. Mr. McCloskey is the Executive Director of the Suffolk Humane Society. The Suffolk Humane Society (SHS) is a non profit volunteer based organization focused on animal welfare through promotion of pet adoption, spay and neuter programs and support of the Human- Animal Bond. Glenn also noted that the SHS is not a veterinary clinic, animal shelter or animal control center and is not affiliated with either the ASPCA or the PETA organization. 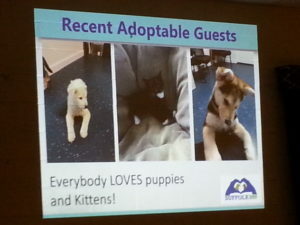 Glenn’s presentation covered the types of animals that are cared for and the goal of finding “Forever Homes” for their “temporary guests”. 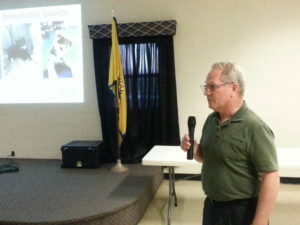 Additional topics discussed included animal population control work with the Neuter Scooter and the BARKS program. The BARKS program (Books and Reading for Kids in Suffolk) is a free program where children read one on one to a therapy dog and their handler in a non threatening environment. This program helps children who are having difficulties reading aloud. The SHS also operates a food pantry for animals designed to aid people in need of assistance with pet food or such things as flea and tick products, litter boxes and food bowls. Because the SHS is a volunteer non profit based organization, they can always use some helping hands. If you are interested in volunteering some of your time or want to make a donation, you can contact them at (757) 538-3030.